Roslyn, N.Y. : Published for the Detective Book Club by Walter J. Black, 1970. 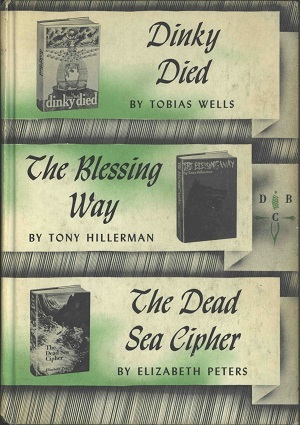 This edition of The Blessing Way was published as a three-in-one bound copy with two other novels: Dinky Died, by Tobias Wells, and The Dead Sea Cipher, by Elizabeth Peters. The volume was offered as a selection to subscribers of the Detective Book Club. The Blessing Way section of the volume is 169 pages (472 pages total). Format: Hardcover, 19.5 x 13.5 cm.